When her husband died Soumicha, mother of three, had to earn a living. She became the only woman taxi driver in Sidi Bel-Abbès, Algeria. This film accompanies Soumicha around a city where religious and political violence rages, and records her experiences in a job normally reserved for men. 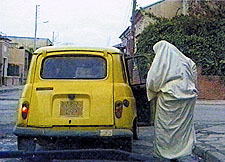 Soumicha's interactions with her fares introduce us to contradictory aspects of Algerian society: men who frown on working women are happy to have a cabby with whom they can trust their wives and daughters; other men are supportive, and critical of Algeria's treatment of women, despite the constant threat of the violent Islamic movement. In the course of her travels Soumicha meets many women, who offer her encouragement (tempered with warnings to be careful), and wave hello when she drives by. Some of the women she meets are actively struggling for more liberties in the face of the militant Islamic movement. As A FEMALE CABBY IN SIDI BEL-ABBÈS comes to a close a rumor that Soumicha has been murdered by extremists spreads through her city. Men who were critical of her are now openly worried and gather for the latest news, until someone spots her yellow Renault 4. The rumor was a warning for Soumicha, and all Algerian women. But she will be out the next morning, still looking for fares, and showing that Algerian women continue to stand up for themselves in the face of violence.